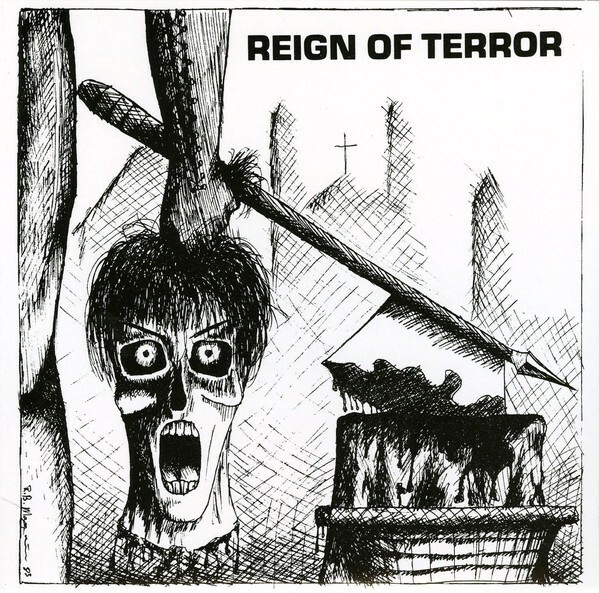 Formed in Los Angeles in 1983, Reign Of Terror was a bit of an anomaly within the greater LA punk scene — they declared themselves "Modern Metal" and played a punk/metal hybrid that wouldn't dominate the landscape until much later. Led by singer/guitar player Ed Danky (ex-Würm), with support from bassist Jesse Fixx (ex-Stains), and a young Japanese punk named David Ishiki on drums, the band played just a handful of gigs and left behind one incredibly rare 7” single and a track on Mystic’s “It Came From Slimey Valley” compilation LP. Perplexing punk and metal collectors alike (and decimating their wallets) for the past 35 years, Radio Raheem and Meat House Productions are extremely proud to present an official reissue of all known recorded material by Reign Of Terror. Unfortunately all three band members have since let this mortal coil, but with the help of SST/Black Flag’s Chuck Dukowski, and surviving family members, the single has been remastered and repackaged with unpublished visual material. Essential!